FUNCTION FOLLOWS FORM at the Rigid String Level, with a Pairing-Splitting Dark Matter Black Hole . : Tidal disruption events (TDE), Star approaching Central Black Hole. Tidal disruption events (TDE), Star approaching Central Black Hole. A tidal disruption event (TDE), producing a bright flare of radiation around the central Black Hole (BH). However, - according to the observations and also Quantum FFF Theory, - the star will not be consumed by the black hole, but torn apart and ejected into two jets and a plasma disc, according to Quantum FFF theory. 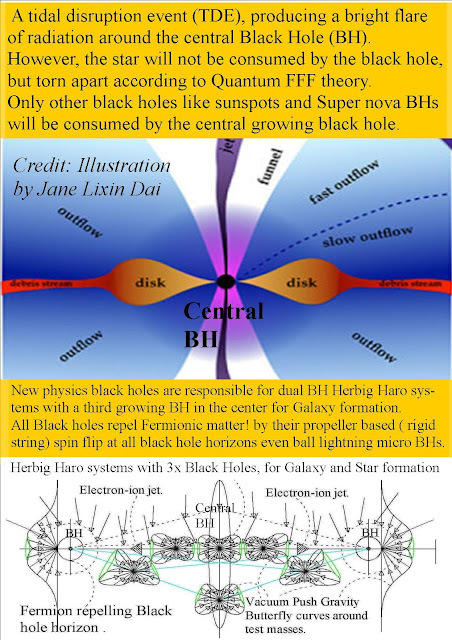 Only other black holes like sunspots and Super nova BHs will be consumed by the central growing black hole. New physics black holes are responsible for dual BH Herbig Haro systems with a third growing BH in the center for Galaxy formation. see also; New model explains what we see when a massive black hole devours a star. The Origin of Life and the Need for a Rigid String Propeller Fermion Model combined with a Chiral Vacuum Lattice and Micro Interference Black Holes.